The music used at the start of every episode of the television series Alfred Hitchcock Presents which is now inextricably linked to the director’s image is entitled Funeral March of a Marionette, apt for a man famous for his puppeteer-like manipulation of the actors he used (famously likened to ‘cattle’) as well as his control in fraying the nerves of the audiences who flocked to see the latest film from the master of suspense. The launching point of Double Take, though, is another kind of manipulation: Hitchcock’s fastidious cultivation of a public persona which was half macabre circus ringmaster, half self-deprecating but sinister uncle; all of those television programme introductions, egotistical public pronouncements and famous cameo appearances in his films had the cumulative effect of making his on-screen ‘performances’ just as compelling as his work behind the camera. Hitchcock, of course, has been the object of copious academic and revisionist attention ever since Andre Bazin declared to the critical world that it really ought to take his films very seriously, a familiarity which tends to make new considerations of his work feel like ground which has been trodden many times too often, like hearing My Way sung at karaoke, or seeing yet another History Channel documentary about the Nazis. 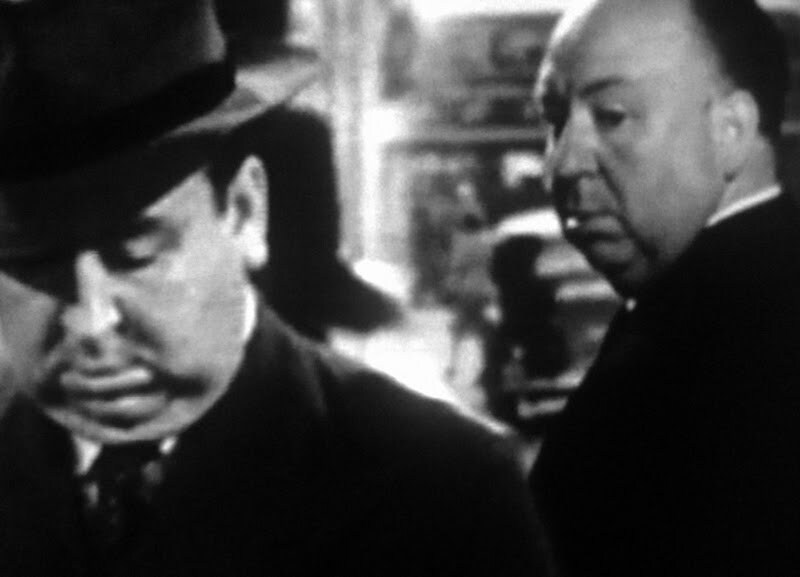 Johan Grimonprez’s film, however, is different, and though Hitchcock appears to be the glue which binds it all together, the film is in fact a tangle of many different subjects of consideration, all juxtaposed together to suggest a network of interconnected mutual associations. It should hardly be surprising given its labyrinthine nature that it is in part inspired by a story by Jorge Luis Borges, namely The Other. The film’s anchor, or as close as there comes to one, is Hitchcock’s 1963 film The Birds, and an apocryphal tale of the director meeting his future self from 1980 whilst roaming the studio set. “If you meet your double you must kill him… or he will kill you” comes the Dostoyevskian warning from Borges; the story seems to carry little significance, yet will come to define the entire contents of the film. Meanwhile, we are also introduced to two real-life ‘doubles’: a voice impersonator learning to mimic a sentence the director recorded many years before, and a physical impersonator who talks about people’s reaction to seeing his likeness, while we are also treated to some of the director’s introductions to Alfred Hitchcock Presents, many significantly involving some form of ‘doubling’ motif. These strands are those which have the most obvious kinship with each other, but also present in the film are a wide variety of pieces of archival footage: now-hilarious coffee advertisements from the 1950s, reeking of the kind of attitude towards women’s role as domestic slave now so successfully exploited in Mad Men, as well as material illustrating the concurrent rise of television as the dominant entertainment medium, at cinema’s expense. So too is there a wealth of material detailing the escalation of the Cold War following the USSR’s early lead in the Space Race – Sputnik, Laika, Gagarin et al – a lurch into politics which seems at least at first merely to be a riff on the likeness of Soviet Premier Nikita Khrushchev to Hitchcock, apparently yet another ‘double’ of his. It is initially not especially obvious what connects these more general social and political elements with the general theme of Hitchcock, but as in the mode of a thriller they start to converge on each other, and their motifs begin increasingly to overlap, to the point where they all become inextricably interlinked. Satellite television, for example, is clearly shown to be a product of NASA’s space programme, which in turn was funded by the US government as an issue of national technological prestige against Soviet technological advances. The Cold War begins to assume the form of a squabble between two twins with competing ideologies, while the resulting nuclear arms race created the climate of fear which Hitchcock himself would readily tap into in films such as The Birds. And then there is television itself, so significant a cultural phenomenon as to have effectively decided the 1960 Presidential Election in favour of John Kennedy, but a subject Hitchcock as presenter of his own programme would repeatedly make disdainful remarks about. In one clip, he sarcastically comments on how the function of commercial breaks was to ensure viewers did not get too engrossed in what they were watching; one of the coffee adverts shown even features a woman who is told by her husband that her inferior brand is like ‘poison’, invariably recalling its use on Ingrid Bergman in the director’s own Notorious (1946). Naturally, such apparent distaste for the televisual medium leads one to question just why the director was apparently so happy to attach his name and image to his own programme on it. Was it a product of the decline of his own career after The Birds, reflective of the wider decline of the cinema after 1960, with the young upstart medium of television evidently victorious over its older, more cumbersome forefather? Here is where Grimonprez finds a unity, one which lies entirely within his film and which brings its themes together, blurring its seemingly disparate pieces into a unified whole, as if to unfurl a Mobius strip to reveal its unseen simplicity. Television won the Cold War, we are told, and, at least in this fictional realm, Hitchcock had been mysteriously warned of it in advance. Double Take clearly shares an affinity with the associative film-essays of Chris Marker, and represents an attempt to thrust a wide variety of different ideas together, not to form one simple thesis but in order to capture a sense of the interconnectedness of political, social, technological and cultural events and shifts. It sounds on paper like a dry exercise in experimental cinema, and its scalene structure suggests a difficult watch. In fact, in its weaving of a web of interconnected intrigues which slowly begin to unravel into each other, it is a grand mystery story perhaps worthy of the great director himself. The first name that sprung to mind when I saw this was Adam Curtis and his ‘Power of Nightmares’ and ‘The Century of Self’ series of slightly didactic essay-documentaries. Grand narrative arcs that spread across history, the vague whiff of conspiracy as all things seem to be interconnected. All impressively illustrated with canny and sometimes ironic clips from the archives of course. My embarrasing ignorance on Chris Marker aside, by way of endless links La Jetee is what inspired The Twelve Monkeys, which in turn quite obviously drawn clear ties with Hitchcock’s Vertigo. As you say with the sheer volume of academic scrutiny heaped upon Hitchcock, this ground is well trodden, but the endless filmic voices on Hitchcock just add to the slightly indefinitely if bloated figure of the man himself. The echo chamber effect, to borrow a buzzy term, but I just can’t get enough of this stuff. Still not quite sure what to make of Double Take, but I’ll gladly return to it after I’ve re/watched some Hitchcock and some more films about Hitchcock.